Photo: Graham Hatton (second on right), Ben Rusden (first on right), Teresa Dougall, NFUS Director of Regions / Dumfries & Galloway Regional Manager (first on left), alongside police officers from Dumfries & Galloway at Dumfries Station. 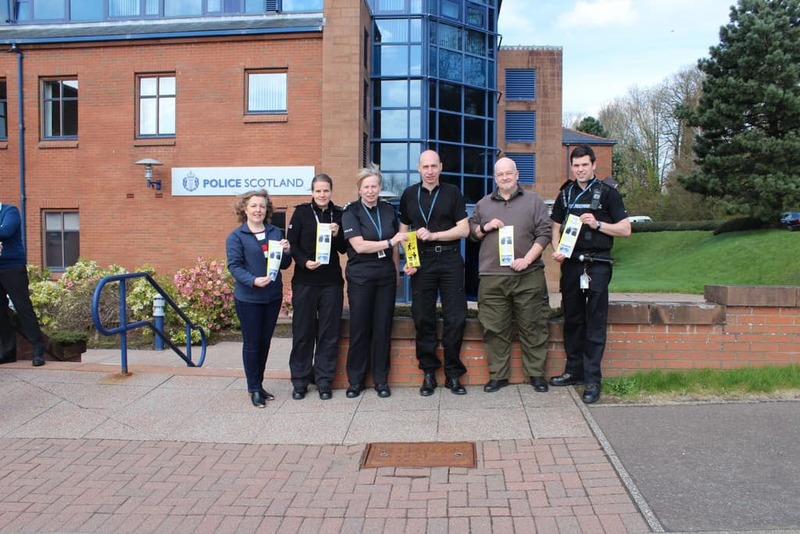 A trailblazing Argyll & Bute police constable has visited the Dumfries & Galloway Police Scotland division to pass on the work he has undertaken to tackle incidents of dogs attacking livestock. PC Ben Rusden, of the Mid Argyll police station, was the officer who dealt with one of the worst cases of livestock attacks in Scotland in recent years when a farm in Inveraray suffered an attack on 17 sheep – 11 of which died as a result of the incident. On Friday, PC Rusden and Argyll & Bute Council Environmental Officer Graham Hatton met with officers in Dumfries to pass on their knowledge and best practices for dealing with livestock attacks. Information shared included advice on obtaining forensic evidence, signage for fields where livestock are located and specially designed ‘advice for farmer’ leaflets on the actions to take by a farmer following a suspected dog attack on livestock. “Many of the images I have seen and the description of incidents are quite traumatic. This work that PC Ben Rusden has been doing is so proactive in reaching out to other police divisions across Scotland to inform them on the best practices to deal with livestock attacks, which statistics show have more than doubled in Scotland in the past decade. “Incidents of livestock attacks occur when an off-lead dog chases and attacks the livestock, mostly sheep, but there have been instances of horses, cattle and calves injured or dead. This is traumatising for both the farmer and livestock involved, and so it is of the upmost importance that police officers are educated on how best to handle such incidents, which depending on the rurality of the area they cover could be something they have never come across before. “I’m delighted this meeting has taken place so that officers here in Dumfries & Galloway will be better prepared when the call comes in that a livestock attack has happened in their area. “I fully support PC Ben Rusden in sharing his knowledge of best practices for handling livestock attacks and for his outstanding work at a local level to raise awareness of this issue and to provide Argyll’s farmers with reassurance that every reported livestock attack will be taken extremely seriously. “Although it is great to receive recognition for all the work I have put in to raising the profile and the Preventing Livestock Attacks in Mid Argyll. I am only one person in what is a very productive and enthusiastic team. “After the horrendous attack last year in Inveraray. It was clear to me that each organisation was working away independently with the best intention but failing to make a real difference. A group of local likeminded individuals had naturally formed from this horrendous incident in Inveraray. “It was clear that collectively we could achieve much more working collaboratively. Each member of the group was able to contribute and we each gained from each other’s point of view and experience. “Having the backing and support from Brian Walker who is a farmer and victim of such an incident. His input throughout the whole process has been invaluable. “In my opinion the most important part of our work is that we have operated locally to challenge and tackle the issue connecting on a personal level. We have established single points of contact who are each passionate about the issue. I feel this has been well received by our local Farming community. “We have developed a number of documents that can be adapted to fit any region.